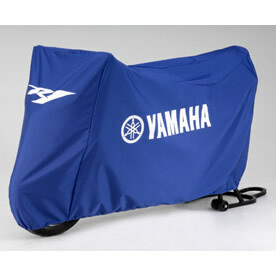 YZF-R1 fitted Motorcycle Cover Made from premium, ultra-durable SurLast solution-dyed polyester fabric. Resists fading, and protects your bike from the elements. Custom tailored for a precise fit for the Yamaha R1. Perfect for storage to keep your bike clean and free from dirt, dust and leaves. Comes in blue or black with Yamaha and R1 logos.